To say I’ve been on a bit of a fried potato kick lately is quite the understatement. Chips, fries, tator tots, puffs, you name it and I’ve found a way to incorporate it into the day’s eats — it was only a matter of time before potato pancakes were added to the mix. 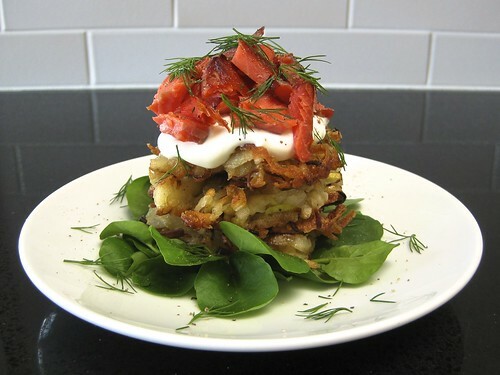 Now, I didn’t grow up eating (or making) latkes, so I certainly don’t consider myself an authority on the subject, but I think I’ve finally got a recipe down for my idea of the ultimate potato pancake. Crispy on the outside and non-bready, non-rubbery in the middle, nicely-yet-simply seasoned with just enough salt and pepper with a subtle onion flavor. THAT is my ideal potato pancake. The key to the perfect texture and flavor: rinsing the shredded potatoes with lots of cold water, draining and drying them super well and mixing it all together with the least amount of extra moisture (eggs) and flour (millet and a touch of potato starch). The mixture is actually not pancake-like at all, but instead more like lightly battered shredded potatoes — scoop up a golf ball worth or so with your fingertips and drop into a shallow layer of shimmering oil, carefully spreading the nest out slightly to make a level pancake. 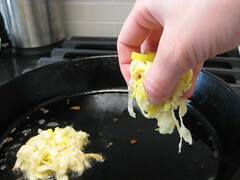 Using leeks in place of regular ol’ onions helps, too — the latter which are far wetter and, accordingly, don’t caramelize in the hot oil nearly as well. And while they do use up a good amount of oil, somehow the result does not taste or feel greasy (definitely use fresh oil, not one that has been used previously to keep the flavor consistent). While I’ve had success keeping fried foods hot and crispy in the oven while I fried batch after batch, I didn’t even bother this time around — I figured a hot pancake would make the sour cream too melty, anyway, but mostly I just didn’t feel like preheating the oven. Amazingly enough, they stay beautifully crisp for a long time — not to oversell it, but I even assembled a stack with sour cream and the works, covered it tightly in plastic wrap and refrigerated the whole mess for at least an hour and the latkes still had some crunch to them — and taste absolutely wonderful at room temperature. This means that if you want to serve single, cooled pancakes topped with sour cream and smoked salmon as hors d’oeuvres they absolutely have enough staying power, and are a nice alternative to blini. The listed toppings quantities are for stacks three pancakes high followed by a generous dollop of sour cream and sprinkle of smoked salmon. Feel free to play around with different presentations, adjusting quantities accordingly! Warm about 1/4″ of oil (about 1/2 cup for a 10″ pan) in a cast iron skillet (or other heavy skillet, preferably not nonstick) over medium heat. In a large mixing bowl (4-quart), mix together egg yolks through black pepper. Stir in leeks; set aside. Drain potatoes very well. Sprinkle about 1/3 of the drained potatoes on a clean, dry kitchen towel. Roll up to absorb as much moisture as possible, then place into the bowl with the egg-flour mixture; toss to combine. Repeat with remaning potatoes (so, two more batches), using a clean, dry towel each time. Once oil is shimmering, grab about a golf ball size scoop of potato-leek mixture (1/4 cup-ish), shaking off any extra batter (not so much needed with the first few batches, but later on), and carefully set it in the hot oil (it will likely splatter), spreading the potatoes out slightly to make a level pancake about 2″ wide x 1/2″ thick. Add about 2 – 3 more pancakes of this size to the pan (for a 10″). Cook on the first side for about 1 1/2 – 2 minutes, or until nicely browned, then flip and fry until browned and cooked through (about 1 1/2 – 2 minutes more). 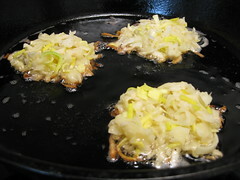 Remove potato pancakes from pan to a paper towel-lined platter or cooling rack to drain and cool. Bring oil back up to temp, then repeat with the remaining potato mixture. Add additional oil to the pan as needed — instead of always maintaining 1/4″ of oil, I cooked about 12 pancakes (reducing the level of oil with each batch) before adding another 1/2 cup of oil or so to the pan. Onto separate plates, stack 3 pancakes, top with a heaping tablespoon of sour cream (more or less to taste) and arrange as much chopped smoked salmon on top as you can manage. Tuck watercress leaves around the stack, if using. Then top salmon with a generous amount of dill fronds, skattering extra around plate. Finish with some freshly ground black pepper and serve. 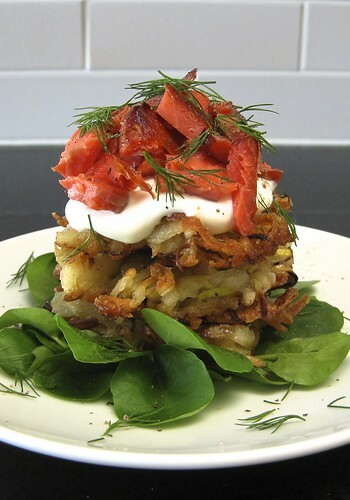 ¹ Since the potato pancakes absorb a good amount of oil, fresh, never-used-for-frying-before oil is highly recommended in order to avoid any off flavors. ² I think 1 whole large egg instead of 4 egg yolks would be an acceptable substitute — I just had extra yolks around and thought the added richness would be a nice touch.